Trying to craft the perfect Tweet? Not sure how many hashtags it takes to improve your post’s engagement on Instagram? Stumped on how many characters you can add in a Facebook Ad headline? Questions like these plague social media marketers every day as you strive to share the best content possible. It seems like social media character limits are constantly changing, so it can be difficult to keep up. At the same time, knowing the ideal length of a Tweet, Facebook post or Instagram caption may improve the likelihood that people will read or engage with it. In order to make your life a little easier, we’ve put together a complete guide with the character length limits for all the major social networks. We’ve also pulled information from several different studies and sources to find the ideal character limits for each network. Want to know if your Tweets, Facebook posts, LinkedIn Updates or Instagram captions are too long or too short? Enter your copy into our social media character counter below and see your results in real time. When you post on Facebook, you’re competing with thousands of other brands for your audience’s attention. Not only that, but the amount of attention your audience has available to give you is limited. Oh yea, and let’s not forget the fact that organic reach on Facebook has dropped dramatically for brands over the years. With all of this going against you, brands needs to do whatever they can to stand out and grab their audience’s attention. A simple and effective way to do that is to make sure you’re using the ideal character length in your status updates. Make it too short, and you risk getting overlooked. Go too long and you might reach the Facebook character limit. So what’s the sweet spot for the length of a Facebook post? According to most of the info out there, shorter Facebook status updates outperform longer ones. Take a more in-depth look below. Posts that contain 40 characters or less earn 86% more engagement. A study from Jeff Bullas found similar results, including that Facebook posts with 80 characters or less receive 88% more engagement. The key is to keep your posts short and concise. Longer posts also get cut off in a user’s feed, which forces them to expand the text if they want to read the full story. And as we mentioned, it’s more difficult than ever to get your audience’s attention on Facebook. The easier it is for them to see your message, the stronger your chances of getting them to bite. Adspresso examined over 37,000 Facebook Ads to find common trends in what brands were doing. 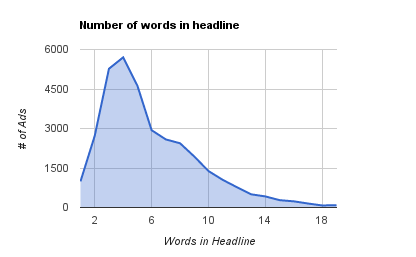 One area they looked at was the average length of Facebook Ads headlines. Since the goal of Facebook Ads is to drive people to take action, it’s not too surprising that most brands opt to go shorter. Plus, shorter headlines look better visually. If your headline is too long, Facebook will cut it off and show an ellipses. 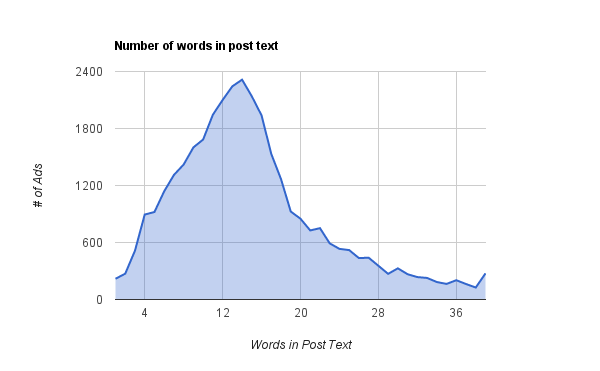 Adspresso also looked at the average length of Facebook Ads post text. This is the smaller bit of copy that shows up just above your image/video. The data showed most brands use 14 words or less. The ad description text is what shows up right underneath your headline. By default, Facebook will pull in meta data from the page your ad links to. But that text might not always be as compelling as you’d want for an ad. Luckily, you can replace it with custom text. But how many characters should you include? 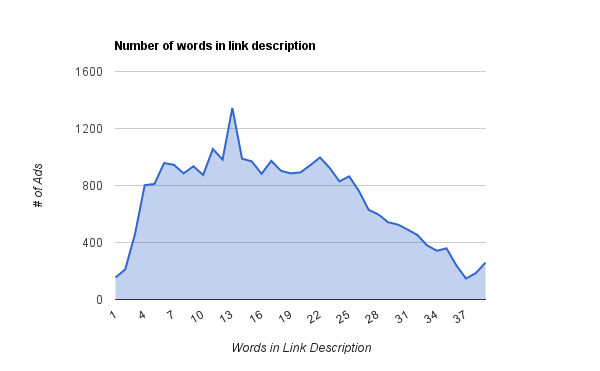 Adspresso found the preferred length of the link descriptions for Facebook Ads to be 18 words. Your description just needs to be long enough to describe where you’re sending people or to add a little more context around your offer. The purpose of your ad is to drive people to a landing page. Try to get to the point as quickly as possible and compel them to take action. Facebook also has a limitation for how much text you can have on the images in your ads. They recommend not having more than 20% of your ad’s image be text. Since this can be difficult to eyeball, they provide a tool where you can upload your image and see if it falls within their guidelines. For years, Twitter has had a 140 character limit. However, in 2017, the network increased the limit to 280 characters. In this section, we’ll go over everything you need to know about Twitter character counts and how to make your Tweets the ideal length. If you’re thinking to yourself, “71-100 characters is really short,” you’re right. Getting your Tweets down to under 100 characters can be challenging at first, but the positive side is it forces you to be concise. Being succinct and clear is key for Twitter since it moves so quickly. You often only have seconds to catch your audience’s attention. According to data from Buddy Media, Tweets with 100 characters get 17% higher engagement rates than longer Tweets. All your Tweets won’t fall within that ideal length, and that’s perfectly fine. But on the other hand, you also have to be careful to avoid going above the maximums. There’s nothing worse than writing out the perfect Tweet, only to realize you’re at 153 characters and have to cut it down. Handles at the beginning of a reply don’t count toward your 280 characters. DM Deep Links don’t count toward your character limit. Images don’t count toward your 280 characters. You can save yourself some frustration and avoid making your Tweets too long by using our Twitter character counter tool above. If you’re like most brands, you may have never even thought of character limits on Instagram. After all, if you read through captions of the top brands, you’ll notice they tend to run on the shorter side. However, you don’t have an unlimited number of characters at your disposal. Let’s take a look at the ideal character lengths on Instagram. If you want to maximize engagement on your Instagram posts, stick to 138-150 characters in your captions. While the star of your posts will be the photos and videos, captions provide context and can compel people to engage with you. So you want to do everything you can to make your captions as great as possible. Facebook recommends capping your captions for Instagram Ads at 125 characters. That’s enough so that the text doesn’t get truncated, and shows up fully on smaller screen sizes. Hashtags are one of the best ways to get your posts seen and grow your audience. Marketers are aware of this, and sometimes resort to stuffing 20+ hashtags into a single post in hopes of getting more visibility. However, filling your captions with as may hashtags as possible doesn’t guarantee results. In fact, it may even backfire by getting your account shadow banned. Shadow banning is when posts from your account stop showing up in searches for specific hashtags on Instagram. It can happen for a few reasons, but one of the most common is overusing the same hashtag in multiple posts. So if you’re using the same 20+ hashtags in all your captions, you’re potentially putting your content’s visibility at risk. Play it safe by sticking to the recommended range and varying up the hashtags you use. In addition to exposing your brand to a shadow ban, Track Maven found that engagement rates start to drop once you go beyond 10 hashtags as well. Which is just even more of a reason to stay within the recommended number of hashtags in an Instagram post. Track Maven also looked at the ideal number of characters in an Instagram hashtag. According to their data, you should stick to hashtags less than 24 characters long. After that, engagement starts to drop significantly. Although you have up to 2,200 characters in your Instagram captions, it will get truncated after 125. So for longer captions, make sure your most important information appears first. Leave any @mentions or hashtags for the end, or even consider adding them as a comment to your post. The maximum character length for captions in Instagram Ads is the same as a regular post—2,200 characters. LinkedIn isn’t immune to character limits. Your headline, position and other aspects of your LinkedIn profile all have limits. Whether you’re on LinkedIn with a business or personal account, get to know the characters limits below. LinkedIn is different from other platforms like Twitter, Facebook and Instagram, in that it’s not as visual. When you take a look at status updates on LinkedIn, you’ll notice most consist of a headline and a link to an article. So it’s not too surprising that the ideal length of a LinkedIn status update is under 100 characters. * We tried to test LinkedIn Publishing’s character limit for articles, and couldn’t find a definitive number of maximum characters or words. It looks like at around 120,000 characters is when LinkedIn will cut you off. You’ll know you’ve gone too far when you get an error message like this and you’ll be unable to publish. When you think of limits on Pinterest, you probably imagine limits on the amount of pins and boards you can have (we’ll include those as well). However, there are also limits to the text areas. There are a couple things you should be aware of with these character limits. For one, technically your profile name can be longer than 20 characters will be truncated by an ellipsis. Also, while your board name can be up to 100 characters, anything over 17 characters may not be visible. Although YouTube is all about video, it does have some character limits for the text fields. While your videos need to be the highlight of your channel, YouTube is still a search engine. As a result, it relies on text to organize and rank content. Not only that, but your video title, descriptions and playlist titles need to be intriguing enough to get people to click. Use titles and descriptions that are within YouTube’s character limits in order to get your content found and to compel people to engage. The “ideal” number of characters for your social media posts are suggestions. Your followers might respond better to longer or shorter text. You have to experiment in order to find out what resonates the most with your audience. At the same time, you do need to stay underneath the maximum character lengths. While these may change from time to time, knowing what they are (especially character limits for posts) will save you the time and effort of rewriting your copy to fit a Tweet, Facebook post or Instagram caption. If you want to play it safe, use our handy social media character counter tool to test your copy before going live.